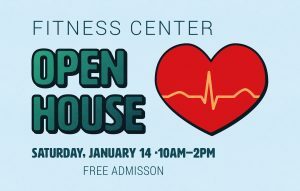 Palatine Park District’s Community Fitness Center will host a free Open House on Saturday, January 14 from 10am to 2pm. The district’s fitness center offers an affordable and convenient fitness option in the heart of Palatine located on the upper level of Community Center, 250 E. Wood Street, Palatine. The Open House will include membership specials for both new and renewing members, snacks, raffles, giveaways, and goody bags. Personal trainers will be on hand to answer questions and provide fitness demonstrations and equipment orientations. Free health screenings will be offered by Northwest Community Hospital from 10am to 12pm, which will include blood pressure and body fat analysis. For more information, contact Abby Krueger, Fitness, Health & Wellness Coordinator, at 847.496.6265 or akrueger@palatineparks.org.